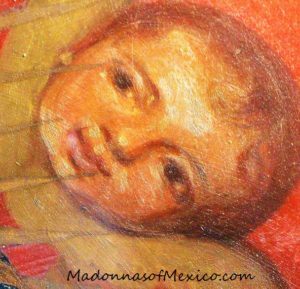 The painting of Our Lady in the Church of Our Lady of the Angels in Mexico City is considered so celebrated and miraculous that it has been honoured by four popes, from Pope Pius Vl in 1793 to Pope Pius Xl in 1923. One pope, Pope Pius Xl, was so enamoured of the painting that he kept a framed copy of the image by his bedside for years. It was one of the few items he grabbed as he fled Italy in great haste in 1848 during the political tumult in Italy. In 1923 Pope Pius Xl authorized the pontifical coronation of the painting with Archbishop Don Mora y del Rio performoing the ceremony. The magnificent crown is visible today! in 1580 torrential rains flooded the Mexican capital.”Streets became rivers and homes were swept away.” Debris was rampant. But out of the flotsam, an Aztec Indian chief named Isayoque spotted a painting of exquisite beauty floating in the flood waters. 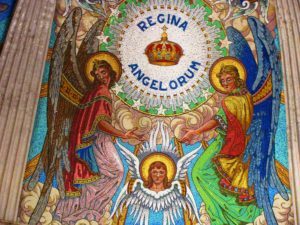 It depicted Our Lady surrounded by a multitude of baby angels. 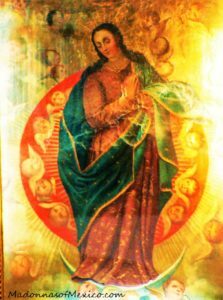 He was so moved by the loveliness of the image that he built a small adobe chapel to honour this depiction of Our Lady. In 1595, worried that the painting was showing signs of deterioration, he commissioned an artist to paint a replica on the chapel’s adobe wall. In that same year the church hierarchy approved the chapel for public worship. In 1776 a pious tailor was passing by the chapel. He was so struck by the painting’s beauty that he was resolved to build a new chapel. With the permission of the Archbishop of Mexico he began the renovations. In 1793 Pope Pius Vl affiliated the Church of Our Lady of the Angels with the Church of St. John Lateran in Rome and granted it all the indulgences to be gained in the Lateran church. 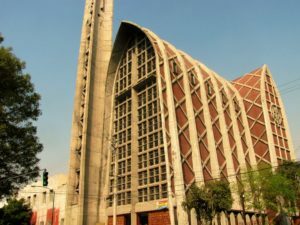 “To recount the marvels worked through the intercession of Our Lady of the Angels would require a volume in itself,” reports a historian. But probably, the greatest miracle of all is the preservation of the image itself. Since 1580, the image’s hands and face have not been “retouched in the slightest.” And still today, it remains “radiant with beauty” according to the author of the book MEXICO, LAND OF MARY’S WONDERS. Best of all, you can see the painting yourself! 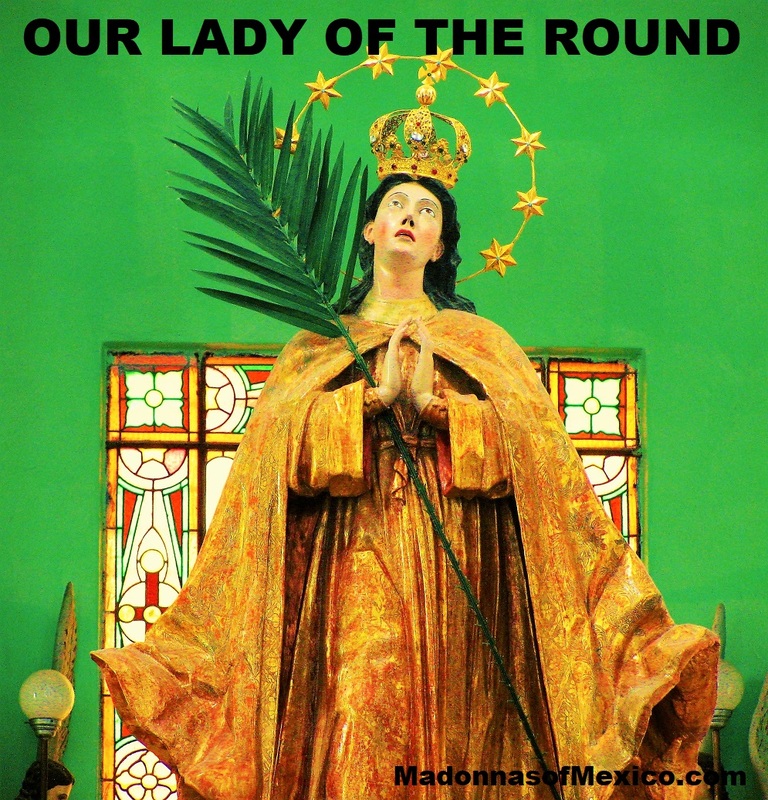 It can be found above the main altar in the magnificent Church of Our Lady of the Angels in central Mexico City. 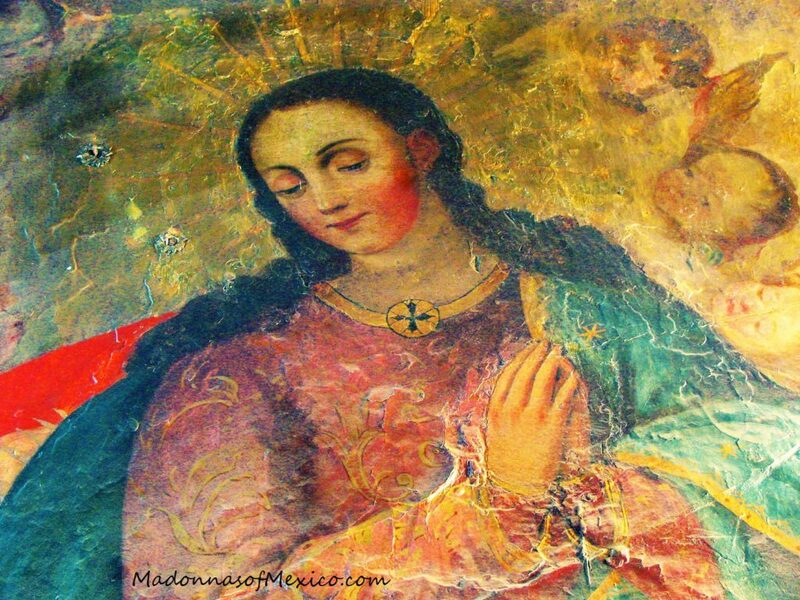 The story of the Dominican convent of La Piedad dates back to 1595. 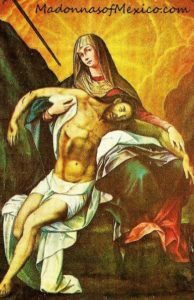 The friars wanted a painting of Our Lady for their new convent so they sent a friar and a laybrother to Rome to commission an image of Our Lady holding her Crucified Son. Once in Rome, the two found a renowned painter who agreed to their terms; however, he couldn’t give them a completion date. “We have to return to Mexico in a month,” they told him. He merely shrugged. In fact, he didn’t seem particularly interested in the project at all! When they went to collect the painting a month later the artist handed them a black and white sketch. “That’s the best I can do!” he said. “But we’re leaving tomorrow!” cried the friar. “Well, that’s too bad,” said the artist, none too concerned. The heavy-hearted Mexicans had no choice. They carefully packed the “painting” in a wooden crate for the long journey home. During the voyage a fierce storm engulfed the ship. “Padre! We’ll all be drowned!” they shrieked.in terror. “Have confidence in Our Lady, Star of the Sea,” answered the priest. “She can calm the waters in a glance.” All on board prayed fervently to Our Lady of Piedad to save their lives. Sure enough, the sea became calm and the pair arrrived safely in Veracruz. As they travelled overland to Mexico City they became increasingly uneasy. “How disappointed they all will be!” murmured the friar. After warmly welcoming the travellers home, the friars were anxious to see the painting. “Open the crate!” they shouted. “Let’s see the painting!” When they removed the wrappings from the container—the sketch was no longer a sketch! Instead, in its place, was a full-colour painting of immense beauty. Full of wonder, the amazed pair knelt before the painting and recounted the extraordinary tale. 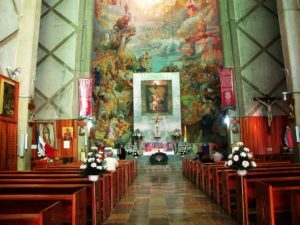 The miraculous oil painting has been venerated for four centuries up to the present day where it hangs above the main altar of the church of La Piedad in central Mexico City. Its size is immense: 9 ft.(3m) in height by 8 ft.(2.5m) in width. The colours today are as vivid and bright as if they had been painted yesterday. Countless miracles have been enacted through her intercession and many of these have been verified by formal ecclesiastical investigation. 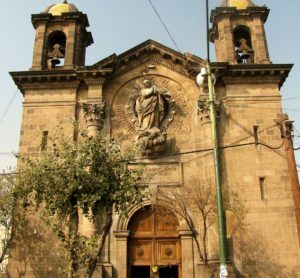 Numerous indulgences have been authorized to the church of La Piedad and it has been elevated to the status of a Minor Basilica. 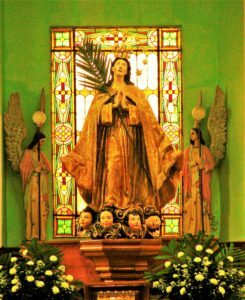 The English name for La Piedad is Our Lady of Compassion. 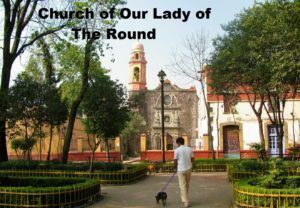 The Church of La Redonda (known as Our Lady of the Round) is one of the oldest in the country. It was founded by the renowned and saintly Fray Padre de Gante in 1524 and was dedicated to the Assumption of the Blessed Virgin Mary. But one is forced to ask: ” Why the strange name? How did it originate?” It came from the fact that the church has an unusually shaped appearance because of the circular shape of its apse. 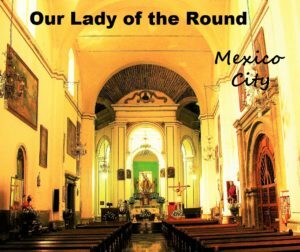 Since the early 17th century the image of Our Lady of the Round has been venerated in Mexico City. 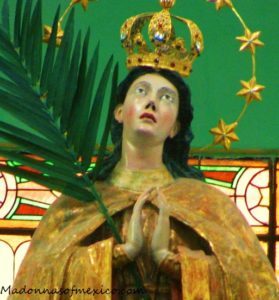 The image’s origins are Spanish: Franciscans from Spain sent the head and hands of Our Lady’s statue to the church of La Redonda. This was common practice in New Spain (Mexico) where the statue would be completed and vested by Mexican artisans. When an elderly Indian woman saw the parts of the statue she eagerly volounteered to complete it. When she arrived home she saw two men waiting for her whom she had never met before. “We’re master craftsmen and we’re here to finish the statue,” they said. The woman readily agreed and handed over the face and hands. Many miracles have been associated with La Redonda; two will be related here: In 1670 there was an “extreme scarcity of rain” in the city. The parishioners, in desperation, requested a license from the civil authorities to hold a procession of La Redonda, with the purpose of praying for rain. This was granted but strict geographical limits were placed on the participants. On July 9, the procession was held with spectacular results: a heavy downpour did, in fact, happen! Strangely, though, the area immediately outside the area of the procession received no rain at all! Not one drop. The area bounded by the limits of the procession was deluged! On December 11, 1676, a fierce fire erupted in a nearby church, the old church of St. Augustine. There was great fear that the fire would spread and engulf the entire neighbourhood. The image of La Redonda was brought in haste from the church. “When the statue neared the blazing building, the flames ceased at once, as though on command,” reported a chronicle of the event. A spontaneous procession of thanksgiving was formed and over three thousand people, carrying candles and torches, escorted the image of La Redonda back to her shrine. The church of La Redonda was declared a national monument in 1932. You can visit it yourself today—it is a well-known historical monument (and active parish) in the centre of the city. Designed by Le Studio Webdesign.